SH problems. What's that thing called? I'm not much on cars, but I know a leak when I see it. I've got a 97' SH and one of my hoses has a leak. WTF is it called? It's the hose/tube thing directly to the right of the dipstick. I need to replace immediately so if anyone can help me out with an answer, it'd be much appreciated. Thanks. Re: SH problems. What's that thing called? Post a picture and circle the hose with Paint lol. It is probably your power steering though. I took this picture out of james6183's thread about his sweet new car. Anyways, that's the hose tube thing!!! Last edited by StockiSH; 03-24-2011 at 04:36 PM. Dangit. Alright, but what's that hose thing called? That sh*t is spewing onto my hood. Also, the help is, like always, very much appreciated. I was going to do that but I got too lazy, $137 for that part is not cheap lol. May want to try a pull and save or Spaldings or something. yea, I'm bored at work. Def try a wrecking yard, or even o'reily's or autozone. 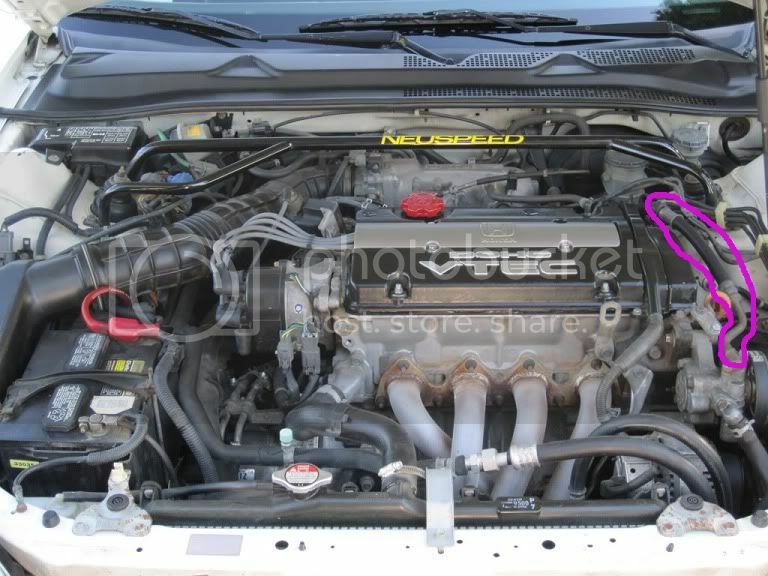 and damn...you could've posted a pic from decent looking engine bay, my old block was ratty and ugly. Another good Idea is finding a member on here who has done a power steering delete and buying the hose from them. Man, 137? Shoot, I'm on a college student's income so that's $137 more than I've got LOL. Thanks for the help and advice guys. I'll let you know what happens. is there just fluid being flung onto the underside of the hood, or do you see a rip/hole/tear in the line? i just rebuilt my pump, and my leak was coming from the bearing...so just wondering IF you actually see the leak. whaaaaaaaaaaaaaaaaaat? um, no. if its just a hose, why would he replace his whole pump? also, its only like 40-50 bucks to rebuild it, so why buy a new one? that is if he even needs to rebuild it.